Broadband Market Assessment: City of Highland, Illinois | Strategic Networks Group, Inc. The City of Highland is 7.6 square miles with population of 9,830 and has the essential infrastructure for digital transformation with the Highland Communication System (HCS). The HCS network provides both residents and businesses with reliability and speed rarely available in communities of similar size. HCS data service pricing is also very competitive compared with equivalent offerings in other markets, as evidenced in the recent Harvard Studythat ranked HCS in 5th in the nation for value and affordability. With 82% of businesses on the network and 52% of households, HCS has good market share. However, HCS wanted to explore strategies to increase revenues, without significant additional investment, including new service offerings and more aggressive service pricing. Highland Communications System (HCS) hired Strategic Networks Group (SNG) in March 2018 to conduct a broadband market assessment of households and businesses in Highland. SNG was hired to assess broadband market demand and the potential impact new services would have on HCS and the City of Highland. SNG gathered essential intelligence directly from Highland businesses and households to develop market analytics and new business strategies. SNG’s research confirmed HCS is a vital asset for the City of Highland by providing high-speed robust and reliable internet access to residents and businesses. 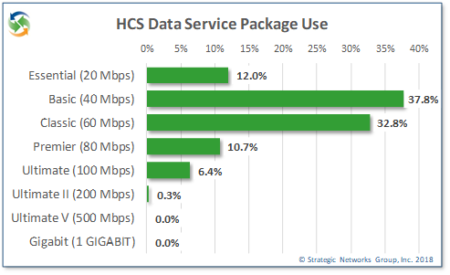 While HCS subscribers have above average satisfaction with their services, the research shows that the majority of households and businesses are subscribing to lower speed packages and underutilizing the service capabilities available. SNG’s research identified strong household demand for the affordable gigabit service that HCS was considering offering. The research also affirmed the growing trend for households streaming video services in addition to, or instead of, subscribing to traditional linear video services. This change in video demand identified opportunities for HCS to change its approach to providing costly video services. The potential for new service offerings for businesses was also uncovered, such as eCommerce consulting, website development, and site security monitoring. SNG’s research confirmed demand for residential gigabit service, allowing HCS to proceed with deployment and quickly signed-up over 60% of the prospect list provided by SNG. By offering gigabit service, HCS is upgrading existing subscribers from lower speed data packages and increasing revenue with no additional investment. To realize the additional benefits and opportunities available to HCS and the City of Highland, SNG recommended two steps be taken with local households and businesses: 1) raising awareness; and, 2) providing technical assistance. 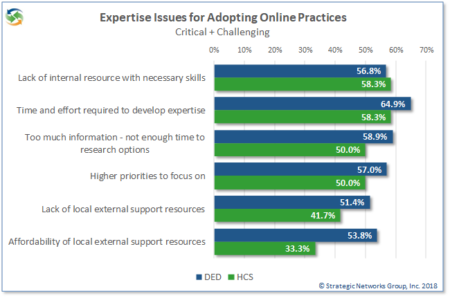 The chart below shows that HCS has a lower percentage of expertise issues as compared to SNG’s Digital Economy Database, but they are still significant with businesses. For both households and businesses, it is important to raise awareness on how they individually can benefit from broadband – this involves public outreach, including public meetings, seminars, etc., and it personalizes the benefits of broadband. This effort is critical as SNG’s research shows that the majority of people are not aware of what they could and should be doing with online applications and new technologies to improve their lives. The second step is to provide technical assistance and support where it is needed and when it aligns with HCS and City of Highland’s goals. If newly implemented online applications and technologies are not known or understood, their full benefits will not be realized – and may even cause people to ask “Why did I spend my time and money on this?”. HCS received enthusiastic support from Highland City Council in September 2018 to move forward with these recommendations and is currently defining strategies and plans for new service offerings.